Detroit/Warren, Mich., Aug 25, 2004 -Chrysler Group today celebrated the production launch of the all-new 2005 Jeep® Grand Cherokee and Dodge Dakota in simultaneous events at Jefferson North (Detroit, Mich) Assembly Plant and Warren (Michigan) Truck Assembly Plant respectively. Chrysler Group President and Chief Executive Officer Dieter Zetsche was joined by Detroit Mayor Kwame Kilpatrick at Jefferson North and Chrysler Group Chief Operating Officer Tom LaSorda celebrated with Michigan Governor Jennifer Granholm at Warren Truck. Others present included Chrysler Group Executive Vice President for Manufacturing Frank Ewasyshyn, UAW Vice President and Supervisory Board Member for DaimlerChrysler AG Nate Gooden, Congressman Sander Levin and Warren Mayor Mark Steenburgh. "The launch of these two products completes our product offensive of nine new vehicles for the 2004 calendar year and is the latest in a long line of 25 new vehicle launches that will extend through 2006," said Zetsche. "With increases in sales and market share driven by our outstanding new products and improvements in quality and manufacturing efficiency, 2004 has been a successful year so far for the Chrysler Group." During the live simulcast between the two plants, Zetsche reinforced the company's long-standing commitment to investing in its urban facilities and workforce, citing as an example 23 of its 24 manufacturing facilities located in urban brownfield sites. "We'll leave it to others to think of 'brownfield' sites as something to disparage and abandon," he said. "We believe it's smart to invest - and stay invested - in our urban facilities and in the communities that surround them. We'll hold up our diverse, UAW-represented workforce against any workforce anywhere in the world." 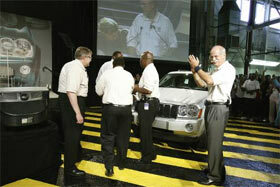 The Chrysler Group invested $241 million in Jefferson North in preparation for the 2005 Grand Cherokee. Significant renovations to the body and paint shops, new equipment and the implementation of innovative processes will allow the facility to produce multiple models on the same assembly line while concurrently piloting an additional model. It also has the ability to implement future product introductions with a rolling launch strategy, minimizing production loss. Even with the addition of many new high-tech product features on the Grand Cherokee, the plant has built in consistent quality with each vehicle that rolls off the line. 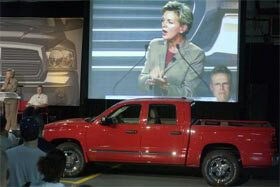 Changes at Warren Truck began several years ago when the Chrysler Group invested $156 million in preparation for the 2002 Dodge Ram launch. An additional $100 million was spent to prepare the plant to build the 2005 Dakota. But one of the most significant changes at the plant - and a rare occurrence in the automotive industry - was the launch of a third shift earlier this year, during which the company invested $35 million and added 900 new jobs. Warren Truck is a model for flexible manufacturing -- running 24 hours a day, up to six days a week -- and building a few million permutations of the Ram and Dakota, a number that will increase when one more mid-size truck model is added to the mix in 2005. Chrysler Group has significantly reduced capital expenditure with each product launch by renovating brownfield sites and reusing existing plant equipment wherever possible. Adopting more robotics and extensive quality processes, Chrysler Group's goal is to combine greater flexibility, quality control and cost savings into every manufacturing facility. Each Chrysler Group plant uses Chrysler Group's Operating Principles as a guide to operation. The Operating Principles go beyond the assembly "handbook" and represent the way the company is creating a flexible system throughout the supply chain, at the same time providing standardized methods and repeatable processes. Employees monitor their contributions in the areas of safety, quality, delivery, cost and morale (SQDCM), internal gauges that each team member directly affects. Because continuous improvement is one of the core beliefs, the process never stops. Evidence of these principles can be found in Chrysler Group's continuous quality improvements, benchmark productivity gains, and the plants' standardized processes, ability to use visual management, manufacturing flexibility and its commitment to training.